A very different evening from yesterday's post. 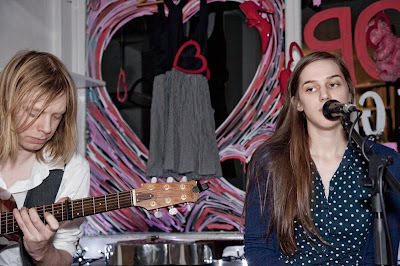 At the charity shop Ayoka, see my previous post about this worthwhile charity, last nights guest was the incredibly talented Josienne Clark, accompanied by Ben Walker. She describes her music as folk dipping into blues. I found her hauntingly beautiful voice reminded me of the great Celtic singers. Mary Black comes to mind. However she is described this duo is one to watch. Her new album One Light is Gone an absolute must buy. To see other songs check this youtube. Her eyes are what catch attention. thank you, I went and bought this on Amazon just now. I love deep, folksy music like this! Thankyou for coming down! We had a great time! I actually ended up going to see Ben&Josienne today, all because you posted this earlier in the year! they were great =) thanks for introducing me to them!